Hey there. 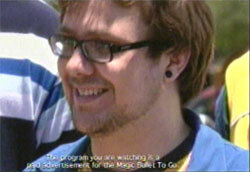 My name is bill beck and I actually had a speaking role in the magic bullet to go infomercial. I played the guy that came up and said, to Mick and Mimi, “Mick, Mimi, all this food is amazing!”, yet you failed to mention my brilliant acting debut in your review. Yes, Hazel might be a little more important to the whole commercial, but without me how are you to know that all that food was amazing? Please let me know what can be done about this travesty of justice. My review of the Magic Bullet To Go infomercial had indeed left Bill’s performance unmentioned. In fact the entire tailgating scene in that infomercial was little more than an afterthought in my reviewmostly because it seemed like afterthought in the infomercial. When did you tape the Magic Bullet to Go infomercial? Where? We taped it on a hot day in the summer like 5 or so years ago in the parking lot of the [Los Angeles] Coliseum. How did you land your role in the Magic Bullet to Go infomercial? I was actually there as an extra for the day. The casting director is my brother’s sister in law. I was just supposed to be walking around in the background, but they realized that they had a few extra lines and no characters to voice them. I wish I HAD seen the original Magic Bullet infomercial or I would have acted a little more like the iconic cast and not just played it straight. Was your character given a name in the script? My character’s name in the script was simply, “Tailgater”. I should probably add that to my EXTENSIVE IMDB page….. Yeah….. Extensive. Had you seen the Original Magic Bullet infomercial before taping the Magic Bullet to Go? Were you excited to appear in the sequel? I had NOT seen the original. I was excited to appear in ANYTHING. I hadn’t been an extra in a whole lot of anything at that point. Hell, I would have been happy to play Hazel’s cigarette…… Hmmmm maybe not. Did you actually get to eat any of the food? Was it amazing? I did NOT get to eat any of the food and I probably didn’t want to. It was all sprayed with oil to make it look better on camera. I’m not saying that I was LYING when I said that. Maybe the food was amazing in other ways than how it tasted. Maybe that food could cure cancer…Maybe the food was AMAZINGLY oily…The world may never know. Did you interact with Mick and Mimi at all? What were they like? I interacted with them really as much as you see in the commercial… For probably around 3 or 4 takes. They seemed like cool people. A good handful of their lines were loosely improvised and they seemed to have a good time creating new names for any if the different “amazing” tailgate foods. Could you provide any other interesting info about what it was like to be on the set of a Magic Bullet infomercial? My line was originally, “Mick, Mimi, all this food is amazing! I have never been to a tailgate like this before!”, but like all big Hollywood stars like me, my best work was left on the cutting room floor. Thanks for your answers, Bill! I am most intrigued by the comment, “I wish I HAD seen the original Magic Bullet infomercial or I would have acted a little more like the iconic cast and not just played it straight.” That probably would have meant delivering the line with a cocktail in one hand and a prop cigarette in the other…oh, what might have been. I am disappointed that Bill’s character was only named “Tailgater” in the script, as I was hoping that they would continue the Flintstones naming theme (Dino, Barney, Betty) and give the character a name like Mr. Slate, Bamm-Bamm, or the Great Gazoo. I Have Finally Seen the Magic Bullet to Go Infomercial! Mick Hastie of the Magic Bullet Infomercial: English or Australian? Please Help! Where Can I Watch the Magic Bullet To Go Infomercial? If only Bill Beck had realized at the time that he was a part of infomercial greatness. How things might’ve been. Thanks for the insider interview! Bill has a good sense of humor about his brush with greatness. I never saw this one, though I remember watching the Red Devil and original Bullet commercial several times (thank you, insomnia!). As someone whose workplace is less than half a mile away from the Coliseum, I feel myself part of that greatness too!